I read a story somewhere about the inclusion / design of the beam. 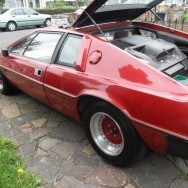 Apparently ACBC was adamant the Esprit didn't need it & was due to be picked up by the first prototype from an airport. The story goes it collapsed just as it pulled in to pick him up. I think the gearbox mountings were designed to be part of the structure, it just wasn't strong enough in practice. Maybe someone knows more about the original tale? Mine's bright / fluorescent green - I thought it was a particular type for early alloy engines? Only came to check as I just found a leak and was seeing if anyone could help me identify trapped air "hotspots" :-( Sorry for the pun again, I'm actually being serious - Bled the radiator, but still unhappy when engine gets up to temp..... Any suggestions? Brake Caliper Pistons - flat or cut? I've an S3 with colour matched binnacle but find it a real pain at night. Glare from oncoming traffic gives an annoying bright patch on the windscreen just where it's not needed. If you get the choice, go for the black as driving with shades at night is a bit difficult. Good to hear you're all sorted. As if by magic my passenger side stopped moving last week!!!!! Easily fixed with a bit of fiddling...........for now.